* Bain à remous privé et le pont. * Entrée privée à l'étage principal, ski à votre porte. * Mise à jour condominium dispose d'appareils électroménagers en acier inoxydable, cuisine et salle de bains comptoirs en granit, planchers de bois franc, tapis indiens à collectionner, et un salon confortable avec cheminée à gaz et meubles en cuir. * bar en granit et le caryer Sièges de table 9. * Chambre des maîtres avec lit King et salle de bain, chambre d'hôtes avec lits jumeaux construit sur mesure sur un lit queen, lit de repos dans le salon et lit dans excentrique échelle consultée Loft. * Un de seulement huit condominiums au Legend House Kayenta. * Ski in / ski out, la randonnée et des pistes cyclables juste à votre porte. * Steps to Gondola, ascenseur 4, école de ski, des restaurants et des commerces. * Pas besoin d'une voiture ... Télécabine gratuit tour à Telluride ou utiliser gratuitement «composer un ride 'un service de navette à Mountain Village. * Étonnamment calme et privé avec vue sur la station de ski et les montagnes. Our family of four spent 5 nights at this property and had a fantastic time. The location cannot be beat. It is so convenient to walk to Mountain Village for restaurants, shops, and the gondola. Kris obviously takes excellent care of the condo and was great throughout the process. In our opinion this is one of the best ski in/ski out properties you will find. We would love to stay here again. If I was really smart I'd say something terrible about Kayenta 2 so no-one would stay there and I could have it all to myself, but that wouldn't be fair. Telluride, the Mountain Village and Kayenta 2 were the complete package for my family and I.
I don't think I've enjoyed a skiing holiday as much as this one and the main contributing factor was our accommodation. There is not a single better located condominium complex than Kayenta and Number 2 is perhaps the best of all. We could put on the skis outside the doorstep and ski to the Chondala or the main village lift - No. 4. We were steps from Talay (at the Inn at Lost Creek), moments from Tomboy Tavern and a very short walk to the main gondola and access to the town of Telluride. The Apartment/Condo was everything we expected it to be . . . and more. Two well appointed bedrooms (each with a TV), a cosy loft, a fully functional kitchen with every possible amenity, a laundry, a couple of bathrooms and a great little hot tub that was almost as inviting as the Telluride ski slopes. But the location was the key factor in our enjoyment of Telluride. Having the skis on our doorstep and the ability to ski down to the lifts took the hassle out of skiing - No "ski valets", overnight storage and carrying skis to the lifts. It could not have been more perfect. Everything we could possibly need for a relaxing ski holiday was available at Kayenta 2. To be able to walk everywhere in the Mountain Village, to have such great access to the lifts and with such cosy and well appointed accommodation, it is hard to believe that there could be a better package than Kayenta 2. This is our second stay at Kris's property. We came back to Telluride telling ourselves that we will only come back if we can stay at the same place-period. We couldn't bear staying anywhere else ( or worse skiing past it lamenting what could have been! ). Thankfully we worked with Kris's schedule. Incidentally Kris is very communicative and easy to work with. Quite seriously this property is so beautifully located, ski in-ski out that is is the best located ski property I have used anywhere in the world (North America, Japan, Australia). The property itself is VERY comfortable and quiet. 2 bedrooms for up to 5 people and an extra queen in a loft over the kitchen. 2 separate bathrooms with towels exist, all clean and in good order (I suggest you bring shampoo). The kitchen is very well appointed with modern appliances and commonly used spices, salt sugar etc.. We cooked in a lot this time with ease. There is a breakfast bar and separate dining room for eating. The lounge room is very comfortable with good TV/cable. The rear of the property which faces the slopes has an entry with large heated armoire to place boots etc. 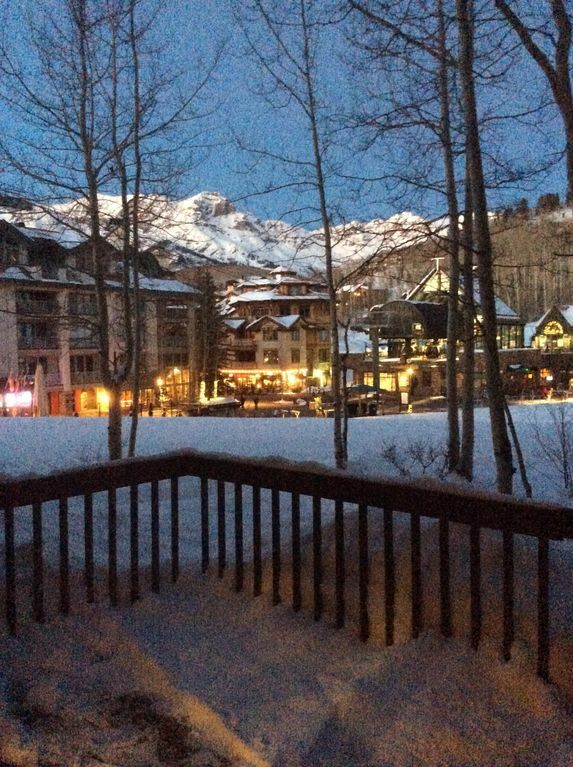 Rear balcony has a hot tub overlooking the slopes-great at the end of the day. Wireless internet is fast and faultless. Plenty of storage for all your ski stuff and just a few steps to the center of the village and gondola. We thoroughly enjoyed our stay! Great experience, Great stay @ great location !!! Want to thank Kristin for a great Telluride B&B experience. Been coming up to the festival for 10 years and have stayed at a range of places and this was by far our best experience. From the initial booking, Kristin was very helpful in making sure that all elements of the stay were spot on. The condo location was super convenient to mountain village and the accomodations were fantastic. From the rooms, to the hottub to the living area, everything was very comfortable !!!! Thanks again for making B&B 2018 one to remember! Scott from Austin! This is a perfect choice for two couples or a larger family with children. Located just off the Mountain Village square, it is an easy walk to the Gondola and all of the Mountain Village shops. Situated on one floor (with a large loft for kids / teenagers), it is easy living. The condominium is comfortably furnished and quiet. There is easy access to the unit as you come and go using a private entrance at the back deck, which adjoins a path that leads to the square. There is a hot tub. The master bedroom has a very nice bathroom; the other bedroom had a bunk bed (Queen / twin) and is very near a hall bathroom / shower. There is plenty of closet space and hangars, a nice kitchen, and comfortable couch and gas fireplace. We hope to stay here again.